Estella's Revenge: #Bloggiesta AND #24in48! Friday night I was super stoked to get a jump on #24in48 and I thought of some random #Bloggiesta tasks I could do. I was high on a steroid shot from earlier in the day for a sinus infection, so I sat up reorganizing my Feedly into easy-to-read folder-chunks, and I commented on lots of blogs. I even sat down and read about 100 pages of Harry Potter and the Order of the Phoenix. Meanwhile, hubs made great and daring progress putting together our new entertainment center and the new flat screen TV. We have officially joined the 21st century with a non-tube TV. We still don't have satellite (with no current plans to get it), but it's a significant upgrade nonetheless. Saturday dawned early. I was again motivated to get on with my reading. 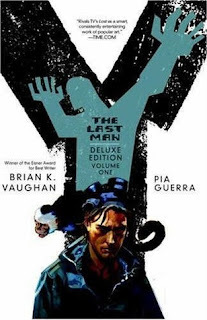 I left the hubs in bed, grabbed my coffee, and proceeded to throw myself into Y: The Last Man Deluxe Book 1 by Brian K. Vaughan and Pia Guerra. And that's where things kinda tanked. While I was really loving Y, we had stuff to do. Hubs loaded up a recliner to take to the landfill...it was seriously beyond salvaging. While he was gone I cleaned up the masses of clutter that had piled up over the last week, swept and vacuumed, and ate lunch while watching The Wedding Date on the new TV. When David got back, my mom came over for a visit and we moved the old furniture out into the garage for a charity pick-up next weekend. So then I had to vacuum again. Insert shower, more clutter clearing, and a quick trip to Marshall's for throw pillows and we're going on an early dinner time. After steak, Mediterranean veggies, and fresh croissants I realized I have two online class sections starting on Tuesday, so I got Unit 1 locked and loaded for those folks, and then we watched the first new episode of Sherlock (whoaaaa, mindfuck), and then I finally read. I crammed in another couple of hours for a grand total of maybe three hours of reading?! Not my best work. Once my eyes gave out, I did a task that seems very Bloggiesta to me even though it only partially affects my blog. I archived all of the Nook books in my B&N account that I've read! Now I won't have to wade though them to get to the unread books. Oh well...there's still tomorrow. I managed to finish Y (really liked it, 4 stars! ), and I got another 100 pages into Order of the Phoenix by quitting time on Saturday. And 10 hours later, here I am! Got a little reading done today...more Harry Potter and the Order of the Phoenix, dipped into The Unfinished World by Amber Sparks, and I made another go at Americanah by Chimamanda Ngozi Adichie. I'm thankful to #24in48 for getting me reading at least a bit on a weekend I probably would've otherwise not read at all because of house stuff. And thanks to #Bloggiesta for the inspiration to organize! I'll finish off the night with a little Order of the Phoenix, and we'll see what tomorrow's day off brings. Good night friends! Thanks for the push to getting my Feedly reorganized too on Friday. I accidentally did delete all the feeds, but I think I have most of them back and now have them arranged by the names of the bloggers instead of the names of the blog. For me, it makes more sense since I think of you all as friends with first names. I remember our first non-tube TV (still the one we have). It's sooo nice, isn't it? Also you're too hard on your self...three hours of reading! That's great. We watched the new Sherlock last night, thought it was only going to be a Christmas story not related to the rest of the story, and we were pleasantly surprised. It's frustrating when the weekend seems to get away from you, but sounds like some good tasks anyway. I love the photos on Instagram of your new couch -- so pretty! I hope you get lots of time to read today! Glad you're enjoying Y: The Last Man! I liked that series. I think 3 hours of reading is pretty darn good considering all the other things you had going on. Getting your living room redone is so exciting!! Busy weekend. Getting rid of stuff is so satisfying. I agree with Kathy. Three hours of reading is much better than I've managed. I'm hoping to get through my bloglovin' feed today and get a few posts drafted, then maybe curl up in Rod's chair (since the couch is too close to the windows and it's freakin' cold outside!!) to read for an hour or two. It's amazing how fast the weekend hours fly! I'll bet you're loving your new furniture. What a great start to the new year, right? I've been de-cluttering here and there, tacking a cupboard or drawer, little by little. Cleared out a ton of old sweaters to donate and gathered up a few things to add to the future garage sale stash. Definitely a satisfying feeling. Hunkering down inside ALL day. Did I mention it's cold?! NEGATIVE 7 when we got up this morning. Dang! Oh, and I can't wait to start binging on Sherlock!! We're still hooked on Jessica Jones. Love that show, but it certainly creeps me out. You definitely had a very good weekend! Bookish too. Your living room is shaping up so nicely it's making me want to reorganize too. Some day, I should do Bloggiesta - I have a ton of things to sort out. It sounds like a productive weekend, nevertheless! I too recently went through my Kindle and removed anything I'd already read. I wanted it to be nice and neat for tackling Kerry's Clean Your Reader challenge, and, uh, I have a LOT of cleaning to do. I'm glad you enjoyed what you did read and got some good organizing done! Hmm, this sounds a lot like my attempt at 24 in 48, Andi - ha! I'm so glad I wasn't the only one that had life happening at the same time! It's great to have a reason to think more about it, though, even when there's so much else going on. I loved your Sunday morning selfie, by the way. Yea, this is why I don't really participate in any readathons other than Dewey's. I put too much pressure on myself to read all the time, much to the neglect of everything else. When I don't have that pressure, I can usually fit in a lot of reading time on the weekend, these last two weekends notwithstanding. I am thoroughly enjoying your pictures of your "new" living room. So pretty and cozy!